Hans Gensfleisch Gutenberg von Sorgeloch was a young patrician--born at Mainz, a free and wealthy city on the banks of the Rhine, in the year 1400. His father, Friel Gensfleisch, married Else von Gutenberg, who gave her name to her second son John. It is probable that if Mainz, his country, had not been a free city, this young gentleman would have been unable to conceive or to carry into execution his invention. Despotism and superstition equally insist upon silence; they would have stifled the universal and resistless echo which genius was about to create for written words. Printing and liberty were both to spring from the same soil and the same climate. Mainz, Strasburg, Worms, and other municipal towns on the Rhine, then governed themselves, under the suzerainty of the empire, as small federal republics, like Florence, Genoa, Venice, and the other states of Italy. The nobility warlike, the burgesses increasing in importance, and the laboring population vacillating between these two classes, who alternately oppressed and courted it, from time to time, here as everywhere, fought for supremacy. Outbursts of civil war, excited by vanity or interest, and in which the victory remained sometimes with the patricians, sometimes with the burgesses, and at others with the artisans, made them alternately victors, conquered, and proscribed. This is the history of all cities, of all republics, and of all empires. Mainz, was a miniature of Rome or Athens, only the proscribed party had not the sea to cross to escape from their country; they went outside the walls, and crossed the Rhine; those of Strasburg going to Mainz, and those of Mainz to Strasburg, to wait until their party recovered power, or until they were recalled by their fellow-citizens. In these intestine struggles of Mainz, the young Gutenberg, himself a gentleman, and naturally fighting for the cause most holy in a son's eyes--that of his father--was defeated by the burgesses, and banished, with all the knights of his family, from the territory of Mainz. His mother and sisters alone remained there in possession of their property, as innocent victims on whom the faults of the nobility should not be visited. His first banishment was short, and peace was ratified by the return of the refugees. A vain quarrel about precedence in the public ceremonies on the occasion of the solemn entry of the Emperor Robert, accompanied by the Archbishop Conrad, into Mainz, refreshed the animosity of the two classes in 1420, and young Gutenberg, at the age of nineteen, under went his second exile. The free city of Frankfort now offered itself as a mediator between the nobles and plebeians of Mainz, and procured their recall on condition of the governing magistracy being equally shared between the high classes and the burgesses. But Gutenberg, whether his valor in the civil war had rendered him more obnoxious and more hostile to the burgesses; whether his pride, fostered by the traditions of his race, could not submit patiently to an equality with plebeians; or whether, more probably, ten years of exile and study at Strasburg had already turned the bent of his thoughts to a nobler subject than the vain honors of a free city, refused to return to his country. His mother, who watched over her son's interest at Mainz, petitioned the republic to allow him to receive as a pension a small portion of the revenues of his confiscated possessions. The republic replied that the young patrician's refusal to return to his country was a declaration of war, and that the republic did not pay its enemies. 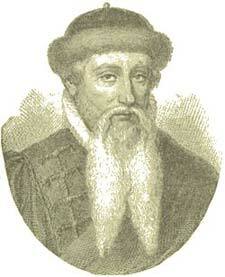 Gutenberg, persisting in his voluntary exile and in his disdain, lived on the secret remittances of his mother. But at Strasburg he already enjoyed so great a popularity for his disposition and his acquirements, that one day, when the chief magistrate of Mainz was passing the territory of Strasburg, he was arrested by the friends of Gutenberg, shut up in a castle, and did not recover his liberty until the city of Mainz had signed a treaty which restored the exile his patrimony. Thus this youth, the great tribune of the human mind, whose invention was destined to destroy forever the prejudices of race, and to restore, in after-times, liberty and civil equality to all the plebeians of the world, began his life, as yet unrecognized, at the head of the patrician party of his country, in these struggles between the privileged castes and the people. Fortune seemed to delight in the contrast. But Gutenberg's wisdom, increasing with his age, was afterward destined to reunite the people and nobility, who looked on each other as enemies. The restoration of his goods allowed young Gutenberg to satisfy his literary, religious, and artistic tastes, by travelling from town to town to study monuments, and visit men of all conditions celebrated for their science, their art, or even their trade. The artisans of Germany then held nearly the same rank as the artists. It was at the time when the trades, scarcely known, were confused with the arts, and when the most humble professions produced their earliest masterpieces, which, on account of their novelty, were looked upon as prodigies. Gutenberg travelled alone, on foot, carrying a knapsack containing books and clothes, like a mere student visiting the schools, or a journeyman looking for a master. He thus went through the Rhenish provinces, Italy, Switzerland, Germany, and lastly, Holland, not without an object, like a man who lets his imagination wander at the caprice of his footsteps, but carrying everywhere with him a fixed idea, an unchanging will led by a presentiment. This guiding star was the thought of spreading the word of God and the Bible among a vaster number of souls. Thus it was religion which, in this young wandering apostle, was seeking the soil wherein to sow a single seed, of which the fruit hereafter was to be a thousand various grains. It is the glory of printing that it was given to the world by religion, not by industry. Religious enthusiasm was alone worthy to give birth to the instrument of truth. What mechanical processes Gutenberg may until then have revolved in his mind, remains unknown. Whatever they were, chance effaced them all, and brought him at once upon his great discovery. One day, at Haarlem, in Holland, the verger of the cathedral, named Lawrence Koster, with whom he had established friendly relations, showed him in the sacristy a Latin grammar, curiously wrought in engraved letters on a wooden board, for the instruction of the seminarists. Chance, that gratuitous teacher, had produced this approach to printing. The poor and youthful sacristan of Haarlem was in love. He used to walk on holydays to the spring outside the town, and sit under the willows by the canals, to indulge in his day-dreams. His heart full of the image of his bride, he used to amuse himself, in true lover's fashion, by engraving with his knife the initials of his mistress and himself, interlaced, as an emblem of the union of their hearts and of their interwoven destinies. But, instead of cutting these ciphers on the bark, and leaving them to grow with the tree, like the mysterious ciphers so often seen on the trees in the forests and by the brooks, he engraved them on little blocks of willow stripped of their bark, and still reeking with the moisture of their sap; and he used to carry them, as a remembrance of his dreams and a pledge of affection, to his lady-love. One day, having thus cut some letters on the green wood, probably with more care and perfection than usual, he wrapped up his little work in a piece of parchment, and brought it with him to Haarlem. On opening it next day to look at his letters, he was astonished to see the cipher perfectly reproduced in brown on the parchment by the relieved portion of the letters, the sap having oozed out during the night and imprinted its image on the envelope. This was a discovery. He engraved other letters on a large platter, replaced the sap by a black liquid, and thus obtained the first proof ever printed. But it would only print a single page. The movable variety and endless combinations of characters infinitely multiplied, to meet the vast requirements of literature, were wanting. The invention of the poor sacristan would have covered the surface of the earth with plates engraved or sculptured in relief, but would not have been a substitute for a single case of movable type. Nevertheless, the principle of the art was developed in the sacristy of Haarlem, and we might hesitate whether to attribute the honor of it to Koster or Gutenberg, if its invention had not been with one the mere accidental discovery of love and chance, and, in the other, the well-earned victory of patience and genius. At the sight of this coarse plank, the lightning from heaven flashed before the eyes of Gutenberg. He looked at the plank, and, in his imagination, analyzed it, decomposed it, put it together again, changed it, divided it, readjusted it, reversed it, smeared it with ink, placed the parchment on it, and pressed it with a screw. The sacristan, wondering at his long silence, was unwittingly present at this development of an idea over which his visitor had brooded in vain for the last ten years. When Gutenberg retired, he carried a new art with him. On the morrow, like a man who possesses a treasure, and knows neither rest nor sleep until he has hidden it safely, Gutenberg left Haarlem, hastened up the Rhine until he reached Strasburg, shut himself up in his work-room, fashioned his own tools, tried, broke, planned, rejected, returned to his plans, and again rejected them, only to return to them again; and ended by secretly executing a fortunate proof upon parchment with movable wooden types, bored through the side with a small hole, strung together and kept close by a thread, like square beads on a chaplet, each with a letter of the alphabet cut in relief on one side--the first printer's alphabet, coarse, but wonderful--the first company of twenty-four letters, which multiplied like the herds of the patriarchs, until at last they covered the whole earth with written characters, in which a new and immaterial element--human thought--became incarnate. Gutenberg, perceiving at the first glance the immense social and industrial bearing of his invention, felt that his weak hand, short life, and moderate property would be spent in vain on such a work. He experienced two opposite wants--the necessity of associating with himself persons to assist in meeting the expenses and in executing the mechanical labor, and the necessity of concealing from his assistants the secret and real object of their labors, for fear lest his invention might be divulged and pirated, and the glory and merit of his discovery taken from him. He cast his eyes on the nobility and rich gentry of his acquaintance at Strasburg and Mainz. He probably met with rebuffs from all quarters, on account of the prejudice then prevailing that handicrafts were derogatory to a gentleman. He was, therefore, obliged to sink his rank, become a workman, associate with artisans, and mix with the people, in order to raise the people to the high level of morality and intelligence. Under the pretence of working together at a new and marvellous craft, such as jewelry, clock-making, and grinding and setting precious stones, he entered into a deed of partnership with two wealthy inhabitants of Strasburg, Andrew Dritzchen and Hans Riffe, bailiff of Lichtenau; and afterward with Faust, a goldsmith and banker of Mainz, whose name, confounded with that of Faustus, the wondrous sorcerer of German fable, the master of mystery, and the friend of the Evil One, caused the invention of printing to be attributed to magic; and, lastly, with Hulmann, whose brother had just established the first paper-mill at Strasburg. In order the more effectually to conceal from his partners the real object of his pursuit, Gutenberg joined them in several artistic and secondary enterprises. Continuing in secret his mechanical researches on printing, he employed himself publicly in these other occupations. He taught Dritzchen the art of cutting precious stones. He himself polished Venetian glass for mirrors, or cut pieces of it into facets, setting them in copper frames ornamented with wooden figurines representing personages from history or fable, from the Bible or the Testament. These articles, which found sale at the fair of Aix-la-Chapelle, kept up the funds of the association, and assisted Gutenberg in the secret expenses reserved for accomplishing and perfecting his design. To conceal it the better also from the restless curiosity of the public, who began to circulate a suspicion of witchcraft against him, Gutenberg left the town, and established his workshop in the ruins of an old deserted monastery, called the Convent of St. Arbogast. The solitude of the place, only inhabited by the houseless poor of the suburbs, covered his first attempts. In a corner of one of the vast cloisters of the monastery, occupied by his partners for their less secret labors, Gutenberg had reserved for himself a cell, always closed with lock and bolt, and to which none but himself ever had access. He was supposed to go there to draw the designs, arabesques, and figurines for his jewelry and the frames of his glasses; but he passed his days and sleepless nights there, wearing himself out in the pursuit of his invention. There it was that he engraved his movable types in wood, and projected casting them in metal, and studied hard to find the means of inclosing them in forms, whether of wood or of iron, to make the types into words, phrases, and lines, and to leave spaces on the paper. There it was that he invented colored mediums, oleaginous and yet drying, to reproduce these characters, brushes and dabbers to spread the ink on the letters, boards to hold them, and screws and weights to compress them. Months and years were spent, as well as his own fortune and the funds of the firm, in these persevering experiments, with alternate success and disappointment. At length, having made a model of a press, which seemed to him to combine all the requirements of printing, according to his ideas at that time, he concealed it under his cloak, and walking to the town, went to a skilful turner in wood and metal, named Conrad Saspach, who lived in the Mercer's Lane, asking him to make the machine of full size. He requested the workman to keep it secret, merely telling him that it was a machine by the help of which he proposed to produce some masterpieces of art and mechanism, of which the marvels should be known in due time. The turner, taking the model in his hands, and turning it backward and forward with the smile of contempt that a skilful artist usually puts on when looking at a rough specimen, said, somewhat scornfully, "But it is just simply a press that you are asking me for, Master Hans!" "Yes," replied Gutenberg, with a grave and enthusiastic tone, "it is a press, certainly, but a press from which shall soon flow in inexhaustible streams the most abundant and most marvellous liquor that has ever flowed to relieve the thirst of man! Through it God will spread his Word. A spring of pure truth shall flow from it; like a new star, it shall scatter the darkness of ignorance, and cause a light heretofore unknown to shine among men." He retired. The turner, who understood not these words, made the machine, and delivered it at the monastery of Arbogast. This was the first printing-press. As soon as he was in possession of his press, Gutenberg began printing. Little is known of the first works which he sent out; but the strongly religious disposition of the inventor leaves no doubt concerning the nature of the labors to which he devoted the first-fruits of his art. They were, to a certainty, religious books. The art invented for the sake of God, and by his inspiration, began with his worship. His later publications at Mainz are a proof of it; the divine songs of the Psalmist, and the celebrated Latin Bible, were the first works issued at Mainz from the machine invented by Gutenberg, and applied to the use of the most sacred powers of man, lyrical praise of his Maker, and lamentation for the woes of earth. Under the hands of this pious and unfortunate man, praise and prayer were the first voices of the press. The press ought ever to be proud of it. But great tribulation awaited him after his triumph. We have seen that the necessity of procuring funds obliged him to take partners. The necessity that subsequently arose of getting assistance for the multifarious labor of a great printing establishment obliged him to confide his occupation, and even the secret of his process, to his partners and to a number of workmen. His partners, tired of supplying funds to an enterprise which, for want of perfection, was not then remunerative, refused to persevere in the ungrateful occupation. Gutenberg begged them not to abandon him at the very moment that fortune and glory were within his grasp. They consented to make fresh advances, but only on condition of sharing completely his secret, his profits, his property, and his fame. He sold his fame to procure success to his work. The name of Gutenberg disappeared. The firm absorbed the inventor, who soon became a mere workman in his own workshop. It was a parallel to the case of Christopher Columbus brought back in irons on board his own vessel, by a crew to whom he had opened a new world. This was not all. The heirs of one of the partners brought an action against him to contest his invention, his property, and his right of carrying on the work. They compelled him to appear before the judges at Strasburg, to make him submit to some more complete and more legal spoliation than the voluntary abandonment he had himself acknowledged. His perplexity before the court was extreme. To justify himself, it was necessary to enter into all the technical details of his art, which he did not as yet wish to make completely public, reserving to himself, at least, the secret of his hopes. The judges, being inquisitive, pressed him with insidious questions, the answers to which would have exposed the secret of all his processes. He evaded them, preferring an adverse decision to the publication of his art. To succeed in penetrating the secret of the discovery which filled people's imaginations, the judges summoned his most confidential workmen, and required them to give evidence of what they knew. These men, simple-minded, yet faithful and strongly attached to Gutenberg, refused to reveal anything. Their master's secret was safer in their hearts than in the breasts of his more grasping associates. None of the great mysteries of the art transpired. Gutenberg, ruined, condemned, perhaps banished, retired alone and in poverty to Mainz, his native place, to recommence his labors and begin his life and fame anew. He was still young, and the report of his lawsuit at Strasburg had made his fame known all over Germany, but he returned a workman to a city which he had quitted as a knight. Humiliation, poverty, and glory contended with each other in his fate and in the behavior of his fellow-citizens. Love alone recognized him for what he had been, and for what he was one day to become. On his return to Mainz, having been relieved from degradation and ruin by the woman he loved, as Mohammed was by his first wife, Gutenberg gave himself entirely up to his art, entered into partnership with Faust and Schoeffer, Faust's son-in-law; established offices at Mainz, and published, still under the name of the firm, Bibles and Psalters, of remarkable perfection of type. Schoeffer had for a long time carried on the business of a scrivener, and a trade in manuscripts in Paris. His travels, and his intimacy with the artists of that town, had made him acquainted with mechanical processes for working in metals, which he adapted, on his return to Mainz, to the art of printing. These new means enabled him to cast movable leaden types in a copper matrix, with greater precision than before, and thus to give great neatness to the letters. It was by this new process that the Psalter, the first book bearing a date, was printed in 1457. Soon afterward the Mainz Bible, recognized as a masterpiece of art, was produced under the direction of Gutenberg, from types founded by Peter Schoeffer's process. The tendency of the new art, which began by cheapening sacred books under the auspices of the Church alone, escaped, during the first years of its existence, the notice of the Roman court, which saw an auxiliary in what it afterward considered as an opponent. "Among the number of blessings which we ought to praise God for having vouchsafed during your pontificate," says a dedication in the time of Paul II., "is this invention, which enables the poorest to procure libraries at a low price. Is it not a great glory to your Holiness, that volumes which used to cost one hundred pieces of gold are now to be bought for four, or even less, and that the fruits of genius, heretofore the prey of the worms and buried in dust, begin under your reign to arise from the dead, and to multiply profusely over all the earth?" Meanwhile, Faust the banker, and Schoeffer the workman, Gutenberg's new partners, were not long in giving way, like his former partner, one Mentel or Metelin at Strasburg, to the temptation of absorbing by degrees Gutenberg's glory, the most tempting of all possessions, because of its immortality. Like many others, they hoped to deceive posterity, if not their own contemporaries. After recognizing, in the Epistle Dedicatory prefixed to the German translation of Livy, printed by Hans Schoeffer, and addressed to the Emperor Maximilian, "that the art of printing was invented at Mainz by that sublime mechanician Hans von Gutenberg," they forgot this confession, and seven years later assumed to themselves all the merit and honor of the discovery. A short time afterward, the Emperor Maximilian, erecting the printers and compositors into a species of intellectual priesthood, relieved them by the nobility of their occupation from all degradation of rank. He ennobled the art and the artists together; he authorized them to wear robes embroidered with gold and silver, which nobles only had a right to wear, and gave them for armorial bearings an eagle with his wings spread over a globe, a symbol of the flight of written thoughts, and of its conquest of the world. But Gutenberg was no longer upon earth to enjoy the possession of that intellectual world, religious and political, of which he had only had a glimpse, like Moses, in the vision of his dream in the monastery of St. Arbogast. Despoiled by his partners of his property and of his fame; expelled again, and for the last time, from his country by poverty, his only consolation being that he was followed by his wife, who remained faithful through all his troubles; deprived by death of all his children; advanced in years, without bread, and soon afterward, by his wife's decease, a widower, he was received by the Elector of Nassau, the generous Adolphus. The elector created him his counsellor of state and chamberlain, in order to enjoy in an honorable familiarity the conversation of this surpassing genius, who was afterward to hold converse with all times and all places. This shelter afforded to Gutenberg sheds everlasting lustre on Nassau and its prince. We meet in history with instances where a generous hospitality has given happiness and immortal fame to the most insignificant potentates and to the smallest of states. 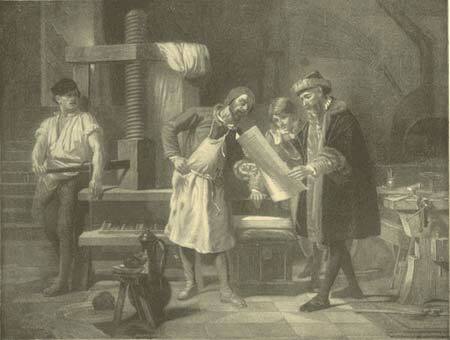 Gutenberg continued printing with his own hands, at Nassau, under the eyes of his Maecenas, the elector, during several years of peace and quiet. He died at the age of sixty-eight, leaving his sister no inheritance, but bequeathing to the world the empire of the human mind, discovered and achieved by a workman. "I bequeath," he says in his will, "to my sister all the books which I printed at the monastery of St. Arbogast." The poor inventor's only legacy to his surviving relative was the common property of almost all inventors like himself--wasted youth, a persecuted life, a name aspersed, toil, watchings, and the oblivion of his contemporaries.